I suppose it's because I'm not actually a big fan of Zelazny's writing that I'd forgotten this vital clue to "The Thief Question." 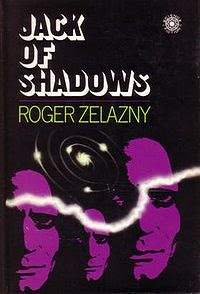 There's something a bit too "psychedelic" about Zelazny's style that doesn't appeal to me. Hmmm... that's unfortunate. Lord of Light is one of my favorite novels (across all genres). What, no mention of Tunnels & Trolls? In Monsters! Monsters! the Shadowjack monster race is an homage to Jack of Shadows. They have his shadowy powers. There's a sweet illo of one by Liz Danforth. Ken St. Andre is a big ol' Zelazny fan. James, I'd also throw Dunsany's Book of Wonder at you, because (a) Gygax clearly considered Dunsany to be an influence, and (b) Book of Wonder is positively dripping with Thieves, specifically, totally non-Cugel non-Conan non-Mouser Thieves, and extra-specifically, non-Conan Thieves going on delves into the Underworld. The Thief - as completely distinct from the Fighting-Man - is unmistakably part of Dunsany's literary corpus. I only mention it because I've seen several people in the Old Skool camp occasionally insist that Thieves-distinct-from-Fighting-Men have no place in Sword & Sorcery fiction. That's true! But OD&D isn't strictly Sword & Sorcery: it's a charmingly incoherent mash-up of many different sources. The D&D thief wasn't intended to emulate Jack, so I don't think it's reasonable to assume that its class abilities are "magical" in nature. Nevertheless, that influence is there and I think it needs to be borne in mind when considering what the thief is supposed to be and how its abilities are supposed to work. I think this single point should not be underestimated when re-examining the thief. The thought that the thief's abilities are maybe "magick-like" or even perhaps "innate" magick, but used for stealth and larceny is a really interesting twist that might lead me to my own S&W thief design. Thank you for that. And yet another book to add to my list to read. Half.com, Goodwill and other used books stores in my area thank you. This is a subtle point. I wonder if the mechanics of rolling percentiles helps distinguish thieving abilities from magic. If for instance the 'opponent' received a saving throw to foil the thief's attempt would his abilities seem closer in kind to the magic of enchanted boots, gloves, or cape? If for instance the 'opponent' received a saving throw to foil the thief's attempt would his abilities seem closer in kind to the magic of enchanted boots, gloves, or cape? Since there is no saving throw against elvish cloaks and boots, that seems doubtful. Although Gygax often disparaged the links between D&D and Tolkien, the "magic" of elves in the latter is very different from the magic of Vance. Elvish boots and cloaks are the best example of the "not quite magical, but seemingly supernatural" abilities of the thief. While I'm not aware of the quote about this being a source for the Thief, I believe this novel also had a big impact on the development of the Illusionist and particular the way shadows and shadow magic was the basis of it. Matthew, you're right. Ironically they even have percentile chance of success. I shouldn't have mentioned garments. I still wonder if the potential observer of the thief instead made a saving throw would that make the thief seem supernatural by association with saving throws for spells. Maybe not. Actually, I am happy with all of the characters in the traditional AD&D canon, including Bards, Monks, and Assassins. Of course, you don't roll to see if the attempt on the life succeeds, you role play it as a mini adventure! The unique ability of the Assassins is the disguise and "Alignment Tongue". There is a real world parallel to it. Women who couldflirt their way to the top and men, who are hated for being penultimate asskissers, and yet work their way to the top anyway. This is a tabboo in the game world,as is Necromancy. Those caught get lynched or put to death in much slower fashion, if the authorities rescue them. What thatvhas to do with thieves is that each character class is a way to experience the game. There is nothing wrong wiht the thief as it was originally written. At the time it was the only skill base charater. They are the most fun to explore Dungeons with. Unfortunately rangers were never quite developed to the same degree with a wilderness related skillset. Problem is, Dungeon exploration has nthing to do with real world spelunking (and in "real" D&D world dungeoners wouldbe alot like spelungers or the tunnel rats, a separate "cxharacter class"), and anyone can roll up a charcacter and explore the Dungeon. To get te same performance out of a ranger in the wilderness, you'd need a real world outdoorsman to play one. The big questiuon is, can you make that kind of play accessible by developing a skill set for the ranger, they way GG developed the Thief class through "thieves' abilities". I haven't read Zelazny yet, but thieves really do live in a world of shadows, physical, mental, social, but it takes a great DM to bring this to the players playing thief characters. I trhink that Gygax's thief is even more hoistoric than Gygax basing Cleric on his notions of medieval church. Consider that Gygax' "Canting Crew" volume is named after a scholarly bookwith the same title about the late medieval/early renaissance British underworld, and apparently he translated a lot of conventions from that historic book into game terms, in his version of the book. moving silently and are nearly invisible in their gray-green cloaks. 3) Greyhawk - Thief introduced, has a percentage chance to move silently/hide in shadows. 4) AD&D - Elf characters gain an increased chance to surprise, cloaks and boots become percentage based. Thief ability to "move silently" is described as "increasing the chance to surprise". There is a definite to and fro between the race, the items, and the class. "not quite magical, but seemingly supernatural"
I think there's a tricky territory to be negotiated here, between abilities, skills and archetypes. I'd agree with James that the D&D character classes are archetypes more than professions with attached skills, and as such I'd say it should not be possible for one class to learn another's abilities. That makes everyone's abilities a bit magicky (or esoteric, at least: not emulable by non-specialists). This doesn't seem to bother anyone where clerics and MUs are concerned, and fighters get a free pass because it's assumed "everyone can fight to some extent, just not as effectively," but for some reason it seems to bother people where the thief is concerned. I wonder if there's a way to phrase the archetype view such that it just makes sense: "talent" maybe? fighters get a free pass because it's assumed "everyone can fight to some extent, just not as effectively," but for some reason it seems to bother people where the thief is concerned. I wonder if there's a way to phrase the archetype view such that it just makes sense: "talent" maybe? It is one of the oddities of the game that increased hit points, saving throws, etcetera are both supernatural in origin, and the result of experience and training. That is to say, all classes enjoy some degree of supernatural power, but the ability to actually "perform" magic is where the line is drawn between "magic-user" and "non-magic-user". Abilities always seemed a good way of phrasing it to me, but then I am not adverse to one class straying into the abilities of another. I have a lot of respect for Zelazny and recognize his immense talent. He's just not quite my cup of tea (which is no crime). You must remember, as I freely admit, T&T is in fact a huge gap in my gaming education. I know very little about it and most of that knowledge has been acquired in the past few months. But OD&D isn't strictly Sword & Sorcery: it's a charmingly incoherent mash-up of many different sources. I believe this novel also had a big impact on the development of the Illusionist and particular the way shadows and shadow magic was the basis of it. That's certainly possible, although the illusionist was originally created by Peter Aronson, who was a player in the Greyhawk campaign. Of course, Gygax picked up and further developed the class and I can believe that he might have had this novel in mind when he did so. Richard, if the AD&D character classes were based on adventuring archetypes, they would be mutually exclusive in terms of their talents, as it is, AD&D is a wargame based on combat. Combat is the common denominator and even AD&D magic is geared to battle. The problem for me is that as AD&D continues to evolve, it becomes less and less narrative oriented. Now, there are new and experimental RPGs, which are completely based on narrative and avoid dice rolling as we know it, but not combat, such as Dust Devils and Life With Master. So, the AD&D character classes are archetypal to the fantasy genre, but they have toomuch in common - fighting style, magic, skill sets, to be truly archetypes. One critic of AD&D has noted that OD&D cteated archetypal characters system that allowed no individuality and since then the movement has been towards character individualization. To that effect the Oriental Adventures added biographic histories to its character generation and Non-WEapon Proficiencies were added. This waas further advanced when WOTC made a marketing decision to publish primarily stuff for players as there were a lot more players than DMs and in contrast TSR was primarily publishing for DMs. Having said all this, I never careed about whioch character lass was allowed and which isn't. Doesn't bother me, game balance is maintained through storytelling and imagination and not through artificial conventions such as levels, limitations on levels, etc. In my game I allow any charcater class from OD&D until @nd Edition complete book of series, and so far playesr have been pretty conservative sticking to generic types. Of much greater concern to me is the leveling up. You don't just get it automatically. Characters have to be parts of different organisations that will tain them or have to find teachers and masters. The higher up in level they go, the tougher the search. A first level character can be adequately trained by the third level character, but a third level needs as seventh or eighth level teacher. Thieves have to find tieves guilds and pay dues, magic Users have to pay a lot of money to be members of magic college, ot pay less to find less efficient private tutors. Warriors have to find their own teachers. That problem I solved by making the players the most active students at a fencong school in a large medieval town (Verbobonc), things were simplified even further when one of the players ended up a knight by strikjing a faustian bargain with the DM. He is a disgraced knight, but a skilled swordsman and a local Baron on the outskirts will take him on and will allow him to establisha fencing school so long as he trains his men at arms for free. Somebofy mentioned that as arhetypes Fighters have no unique abilities. On the contrary, I ued Players Option Combat and Tactics and Weapons Specialization for Fighters to crate skill sets to make the warriors more effective in combat compared with other characters. Skills really do make things more interesting. I have a Ranger Character and another player, who decided to become a fighter and then take on as many Wilderness skills as he can. We shall see the outcome. With regards to Thief, after the adventure ends, he wil have to find a new guild. He has a choice of six, but has onlyu uncovered four: Shadow Thieves - a Neutral Evil organisation, traditonal guild that collects its dues and offers training and advenrture much like a union shaping hall. What makes them evil is that they cheat and rip off settlers who are driven towards the Frontier and aboiut whom nobody cares about. Baron explicitly forbids their wagns from going off the main road and straying into his villages. The other choices are "Night Daggers" (LE) really bad people - thieves and assassins in a paramilitary organisation just moving into territory that demands total loyalty of their members and will try to swallow up the whole party. "Boatmen" (LN) river pirates, they are local fishermen, who rob the boats passing from afar murdering everyone on board. They view themselves as Robin Hood serving their community and most of the loot gets plowed into their militia, which the Baron sponsors since a threat of invasion is a very real concern. You have "Minstrels"(CG), local youths who steal away from home and try to out do eachother in feats of agility, and you have the "Flying Snakes" (CE) these are offspring of one of the noble houses and besides fencing and usual thievery, they practice a little slavery and supply women and booze to anyone that would pay. Each guld will give the thief a slightly different skillset: Shadow Thieves don't deman much and don't give much beyond the regular thieves abilities. Nigh Daggers will take any character and will train them as Assassins in additons to their primary class, there will be secrets and initiations, but players wil lose their independence and will be hunted if they try to leave. Boatmen will obviously make one intoa sailor/pirate. Flying Serpents will turn one into a fighter/thief geared towards night fighting (but not ninja type), and Dancers will develop one into a thief-acrobat, but only to level 6 (2nd level acrobat, I think). Anyway,I think that OD&D sorely neded skills and proficiencies, but in the format of the 4th edition, and level advancement is merely a bare bones outline as presented in the rules, it needs to be both role-played as adventures are, and to be integrated into the game setting. BTW, I revealed to the players about the local underworld a bit at a time. Our thief knew to avoid Night Daggers, he doesn't like swimming or boats. He is vascillating between Dancers and Shadow Thieves (appeal here is pay some gold and get it over with), hasn't met the Flying Snakes decked out in their finery. Player thinks it's just a formality, he hasn't got a clue that it will be heavy role playing and that there will be choices and moral consequences to joining an evil guild and having to become a participant to some degree. He might even choose to quit, but in the above, I gave him an out. I don't think I buy that: "trickster" and "sage" have a lot of overlap, but are recognisably different (both aim to enlighten the protagonist, but by different means). The idea of the multi-tool party composed of one-trick pony characters appears quite different from the idea of archetypes, and if anything seems to be closer to the situation in D&D than much of the source literature (Beowulf excepted). In general I agree with you about character individualisation and the options offered by skill-based systems, though: James' analytical work starts from the position "D&D is right" (but doesn't necessarily end up there); I'm more along for the thought experiment - trying to work out what Gary and Dave might have been thinking when they went with classes (not professions, not skills) to describe characters. Your LN pirates might help me make sense of D&D alignments, BTW: they seem to be LN in their own view (established authorities presumably would not consider them "lawful"). My problem with alignments is that EGG's writing suggests they're absolute (viewed by a theoretical disinterested external observer). If you make them relative - an expression of the character's self-image - they probably (a) make more sense and (b) are more useful in-game descriptors. Richard, I gave a lot of thought to AD&D Alignment system, to try and fiugre it out in terms of our real world. If you go on Niemz' AD&D Chat, I wrote a huge post on "Alignment realism" and how it could play in the real world mechanics. What spurred me is that modern psychological research has found experimental evidence to support that different patterns of moral adm ethical development. Not in terms of acepting values or inductrination, but moral and ethical values becoming deepest personality traits. However, Just like with Astrology, totally separate dynamics are responsible for different alignment axes. But if you look at the post, you'll see what type of people these alignments describe. In terms of pirates, they are driven by the sense of community. The place is called Midlands, Blacklands Barony (from the richness of the soil). Maybe the character of the Baron is unrealistic, maybe he is wise. The Barony is the last line of order behind a frontierm which is a buffer to the wasteland. Survival in teb Wastelands made cannibalism commonplace and developed into a twisted, violent culture that provides substinence by looking beyond immediate survival and that beyond is selfish, Nietzian and demoniac because of the fallout from the powerful magics that turned the land into wasteland and its people into physical goblins and moral monsters. THAT has its own powerful schools of magic and threatens to spill out into the rest of the AD&D world,essentially Greyhawk. The locak natives ad been colonized furst, by Anglo saxon type people, and later by Byzantine culture, that produced the Baron. What really keeps the Wasteland at bay is the religion and magic of the natives. Example of it working would be an elder of the native villagers confronting a werewolf. With but a gesture and a wgisoper he can transfiorm the lycanthrope back inbto a naked human. The religion has to dc with personification of the River, the mountains and the seasons as humans, but I haven't figured out how their magic will work, but it wiull be a system of magic unlike and unavailabk to AD&D characters. The first conquerors have treated the natives like animals, disarmed them and tried to break apart their culture and traditions. Natives are only concerned with survival of their own people when Wasteland finally spills out into the rest of the world, and endured their first conquerors without complaint. Second conquerors brought with them the AD&D version of the Christian Church. Baron's father ran out of money and took 75 of his best men at arms to raid the wasteland for treasure. Nobody returnd except one man, who ws insane and could not tell what happened. Baron gave natives maximum autonomy and ordered his knights to train their militias. At his court first and second conqueror knights are organised into warrior houses and are vying for supremacy. Second conquerors have superios magic and weapons culture. Warrions from conpeting houses secrety venture into the Wasteland and come back twsietd but with new knowdledge. Baron's friendly policy towards the natives could be either because he sees their strength in holding bsck the wasteland or because that policy weakens the first conquerors, so Baron is downright friendly to citizen militias. Into this come the river boatmen. The river is truly archetypal. It fromws from the city f Greyhawk and into the wasteland and into the black ocean beyond. Strange ships and barged pass by without stopping, or sometimes they stop at the local port for provisions. Fishermen fro the local village of first conquerors just north of the port fornthe harnor militia. Tye are all cnsidered to be hardworking and poor. But most people confuse simplicity with poverty. They quality of their cloth, their iron tools, their nives and their women's wedding dresses is superior. that's where they display their wealth. They are a tight-knit, conservatie community, that is worried about both, the corruption of the wasteland and the bad influence of the sailors and the harbor merchants. Seeing their life as more honest and morally superior to the merchants on the docks, they only attack the boats of outsiders fro beyond greyhawk and from frontierlands. Loot is plowed into the militia, at least half of it. Baron likey suspects why his harbor militia is so well equipped, but he is not looking further into it and the merchants doing trade with the local community have not been harmed. With regards to the other guilds, Night Daggers are seen as outside threat and its suspected memebers are killed or interrogate and executed. Dancers are whipped at the stake, if they are caught stealing, and not hanged. Baron says because of their young age, but likely because the Baron secretly favors them and most of them are barefoot villagers of the native stock. The Flying Snakes have partaken of the spirit of the wasteland, but the Bvaron doesn't know that and is probbaluy not even aware that they exist (but they do and they are involved in the highly illegal slave trade). Plus, they are part of the warrior hous that has been proven loyal to the Baron. Shadow thieves, the Baron is aware of them, the men at ars are earnestly trying to protect the settlers and homesteaders moving towards the wasteland, and thieves preying on them are subject to hanging. So, the question, is the Baron of the Blacklands an unrealistic NPC, or is he a shrewd leader capable of effectively defending his holdings agaisnt the wasteland?